Once again the playing is superb throughout the album. 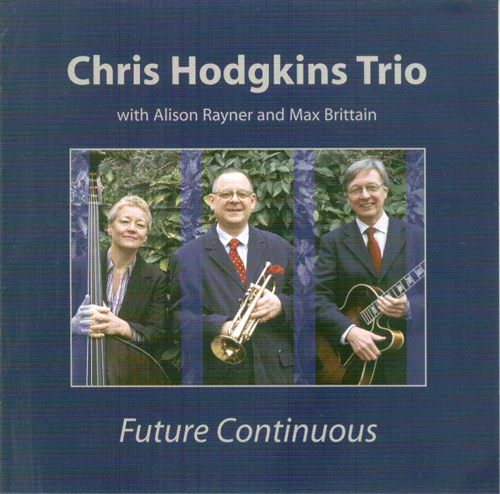 Hodgkins shows himself to be an assured and versatile player and varies his tone by the judicious use of both cup and harmon mutes. Rayner and Brittain are rhythmically supple, swinging and inventive and both contribute excellent solos throughout the album. In a well-sequenced programme the changes of mood, style and tempo mean that there is always something to interest the listener. It is impossible for “Future Continuous” to have quite the same impact as its predecessor but it is still a beautifully crafted piece of work by three superb musicians. Ian Mann, www.thejazzmann.com, Friday, 5th January 2007. His music answers questions: how to make art new without abandoning the tradition; how to have one’s own voice while honouring your ancestors and colleagues. You’ll hear that his music is, on one hand, rooted in a Mainstream tradition: I hear Braff, Lyttelton, Buck Clayton, echoes of Horace Silver and Blue Note recordings of the Sixties, of Henry Mancini and occasionally Strayhorn . . . in a streamlined instrumentation (a trio of trumpet, guitar, and bass on two CDs, enlarged into a quartet on the third by the addition of tenor sax). Chris himself is a singular player; his tone ranging from the silken to the edgy, his lines winding and floating over the ringing lines of Brittain’s guitar, the deep pulse of Rayner’s string bass, and on BOSWELL’S LONDON JOURNAL they all get along nicely with the lemony alto saxophone of McLoughlin. By the way, Chris loves the assortment of sounds and timbres that mutes give to his horn (as well as playing open) so the three discs never sounded like more of the same. I get a bit nervous when confronted with CDs that are all “original” compositions — whisper this: many musicians, stalwart and true, do their best composing on the bandstand, not on manuscript paper (but don’t say it too loudly) so that I was delighted to see some Kern and McHugh, Lyttelton, an Ellington blues, YOU’RE A LUCKY GUY and IF WE NEVER MEET AGAIN. Moving a little beyond the “songbook” tradition, I noted that Chris delights in a wide variety of composers and songs: Neil Sedaka’s BREAKING UP IS HARD TO DO, lines by Conte Candoli, Sahib Shihab, Thad Jones, and Harry Edison. And then there are the originals – varied and lively, in many different moods and tempos. (How could you do anything but admire a man who titles a song SWINGING AT THE COPPER BEECH? And if you don’t get the in-joke, I’ll explain.) Michael Steinman, JAZZ LIVES, http://www.jazzlives.wordpress.com, 22nd January 2011. For obvious reasons Chris has not been the most active of trumpet players but that isn’t apparent in his accomplished trumpet playing or his astute and imaginative choice of material…..For my money though, things don’t get better than the opening Sweet William , composed by the trio’s excellent bassist Alison Rayner(the equally excellent guitar player is Max Britain). Beginning To CD Light, The Jazz Rag 2006. This one is even better and a little more adventurous…..what is there to dislike? Bob Weir, Jazz Journal, November 2006. Imaginative arrangements and tempo variations give the trio a fuller sound than might be expected….There’s a gem-like chamber feel to much of this, a kind of local equivalent to the old Braff-Barnes combo. Kathy Dyson’s “To Summer” deserves to be heard again and it’s good to hear Hodgkins use his plunger on Harvey’s tricky piece “Where’s Trog”. All in all a very satisfying outing for all. Peter Vacher, Jazzwise, November 2006. This set like its predecessor covers a gratifyingly large number of musical bases……..plus a number of standards, tastefully swung. Chris Parker, Jazz Reviews, November 2006. This delightful album gives us over an hour of relaxed, lightly swinging jazz using a refreshingly eclectic repertoire………….All in all a commendable slice of indigenous jazz. Mike Pointon, Allegedly Hot News International , Autumn 2011. Number 50.